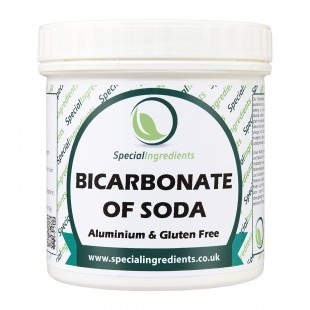 Our Bicarbonate of Soda (Sodium Bicarbonate) is 100% pure extra fine powder. Also known as 'baking soda 's is primarily used in cooking & baking, as a leavening agent. It reacts with acidic components in batters, releasing carbon dioxide, which causes expansion of the batter and forms the characteristic texture and grain in pancakes, cakes, quick breads, and other baked and fried foods. Acidic compounds that induce this reaction include phosphates, cream of tartar, lemon juice, yogurt, buttermilk, cocoa, vinegar, etc. 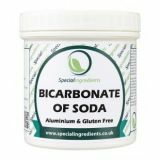 Sodium bicarbonate can be substituted for baking powder provided sufficient acid reagent is also added to the recipe. Most forms of baking powder contain sodium bicarbonate combined with one or more acidic phosphates (especially good) or cream of tartar. Food additive - do not consumer in concentrated form. Add to food mix according to recipe instructions.